Everyone knows that oregano, basil, and cinnamon are great seasonings for flavorful dishes, but did you know that those same herbs, and many others, in their essential oil form, are even MORE potent? It’s true - not only is the flavor stronger, but essential oils offer health benefits when you cook with them that the dried herbs do not. You can ingest (and cook) with any of Young Living’s Vitality oils, which is the Dietary line of oils. With just a drop of oil (or less! ), essential oils give food incredible flavor. Fresh herbs and dried herbs eventually go bad, but essential oils last MUCH longer and can be more cost effective in the long run. Each individual essential oil has a multitude of health benefits unique to it, and you can reap those benefits by cooking with them (as well as through inhalation, applying them topically, and ingesting via capsule). Well, that differs depending on the oil. Generally, you will want to start with less and then add more to taste as needed. Herbaceous Vitality oils, like basil, oregano, thyme, dill, etc are very potent. Start by running a toothpick in the rim of the oil bottle then dipping it into your dish. Repeat as necessary to get the flavor you want. I like to add these oils early in the cooking process and then add more before serving if necessary. For Peppermint and Spearmint Vitality, try using 1 drop per tsp of dried mint. Cinnamon Vitality essential oil is also strong in flavor, so I use 1 drop per 1 tbsp of ground cinnamon. Remember, you can always add more later, but you can’t take it back after you’ve already added it! A little bit goes a long way. When in doubt, start with a toothpick dip and just addmore a little at a time. Every time I tell people that I wash my face with oil they look at me like I've lost my ever-loving mind. And I get it - it sounds gross and counterproductive, but it actually works. When you strip your body's natural oils with traditional face cleansers, it works overtime to restore them which can leave your skin oilier and breakout prone. Cleansing with oil is gentle and leaves the natural oils (while cleansing impurities and makeup) so your body doesn't need to over compensate. I add essential oils that are great for skin to my oil cleanser to help combat the signs of aging. Add one drop of Frankincense essential oil to a few drops of the Oil Cleansing recipe and gently massage onto face and neck. Kick your brownies up a notch and knock the socks off everyone at your holiday gatherings with this gut-friendly recipe! 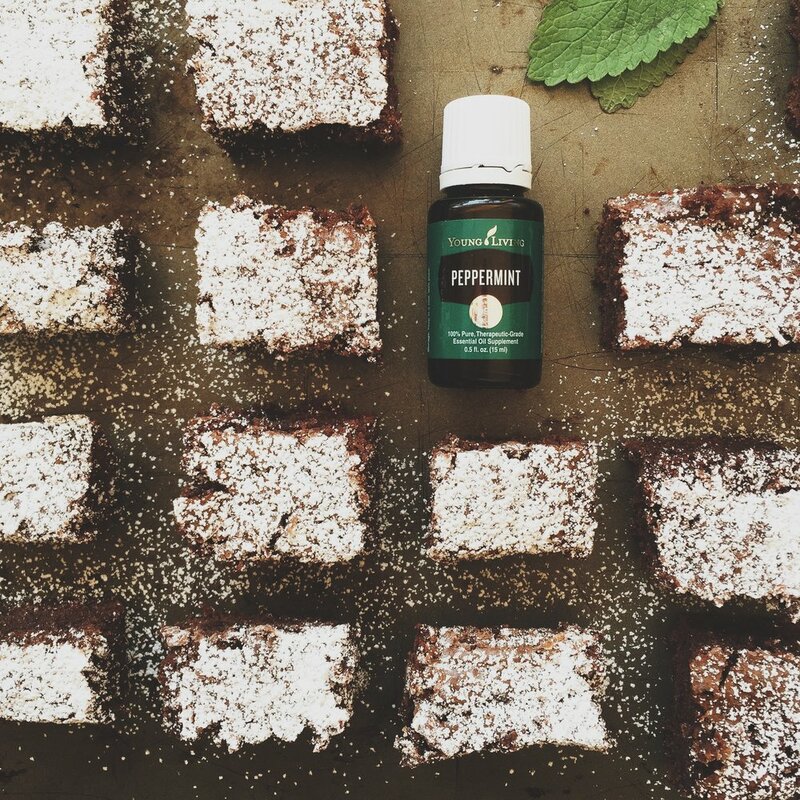 Peppermint essential oil is the secret ingredient. This is one of my favorite uses for peppermint essential oil. I hope you enjoy it too. 1. Preheat oven to 350. Grease an 8x8 baking dish and line with parchment paper, letting the paper hang over the sides of the pan on 2 sides (for easy removal). In a bowl, whisk together the melted chocolate chips, cocoa powder, oil, and water until smooth. 2. In a large bowl, whisk together the eggs and sugar. Whisk in the chocolate mixture. Fold in the flour and salt until just combined (do not over work this). Transfer to baking dish and spread to all corners. Bake until set and the brownie edges start to peel away for the dish. Usually 25 - 28 minutes. Brownies will be moist and slightly gooey. Fully amazing. Sprinkle *lightly* with powdered sugar as a garnish if you're feeling froggy. I quit coffee and pretty much all processed sugar on the same day. Apparently I like to torture myself. J/k. I actually feel so much better once I detox from the caffeine and sugar. Make some and try them out! It's easy peasy. Throw everything into a food processor until it starts to stick together and ball up. Line a 9x9 baking pan with wax paper, leaving the width of the pan in wax paper hanging out. Pour the mixture onto it. Press it down making sure that it's an even thickness throughout. Cover with the excess paper and press down. The oil from the nuts will make it stick. Place in freezer for an hour or until it firms up. Cut into bite size bars and transfer to a sealed dish. Store in refrigerator. They'll stay good in the fridge for 2-3 weeks, and in the freezer for 3 months. I've also made Chocolate Peanut Butter Bites (on the right in the picture) and Pumpkin Spice Bites. I'll share those recipes soon!